In this groundbreaking new 2016 Dark Journalist episode he welcomes the author of the amazing book: Chemtrails HAARP And The Full Spectrum Dominance of Planet Earth, Elana Freeland. Elana's 20 year journey into the realm of covert geoengineering programs, whose goal is to create a dominant Worldwide Smart Grid to ionize the atmosphere, centralize control and institute an all-powerful surveillance state. Elana's investigation draws on the research of scientist Nick Begich and the work of her friend scientist Clifford Carnicom, the leading voices alerting the public to the dangers of large-scale Aerial Spraying and Ionospheric Heaters. Her penetrating insights into the controversial military policy of "Full Spectrum Dominance" and its ties to covert agendas for controlling the atmosphere have led her to secret programs that deal with Weather Warfare, Earthquake and Tsunami Delivery Systems, Nanotechnology, DNA Manipulation and Disaster Capitalism! In her research she has found that the advanced technology that is behind such complex and mind-boggling activities is rooted in the same programs that created the Strategic Defense Initiative (SDI) back in the Reagan and Bush Sr. era that was dubbed "Star Wars" by the media. 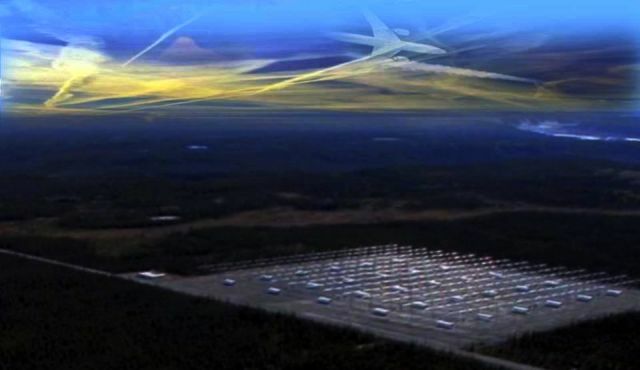 The further development of this technology led to the project called "The Space Fence" in which all life on earth was to be manipulated and controlled from above through nano-sensors with satellites observing the action on the ground. From Smartphone Entrainment to Wireless Surveillance, Data Mining and WIFI Frequency Wave Towers, the public is now paying for the very tools that will be used to control their every move and monitor their every thought, phone call, email, and emotion. Through the news blackout of the controlled corporate mainstream media an average person has little or no knowledge that the air we breathe is being loaded up with nano-particulates to form the basis of a gigantic worldwide antenna that will be hooked into all physical, organic matter and feed impulses into an Artificial Intelligence infrastructure. Mechanized Tyranny or Creative Freedom? Will the Transhumanist agenda of corporate overlords merging with technology to dominate the earth and humanity come to pass? Is this the era of genetically-enhanced cyborg supersoldiers and controller attack drones funded by out of control black budget military programs and puppet-dancer politicians or will the exposure of these dangerous programs cause a radical shift in our 21st century paradigm? The choice apparently is ours. So etwas habe ich mir schon sehr lange gedacht! Diese Chemtrails, DNA, Elf-Wellen, HAARP, geheime Raumfahrtprogramm, geheime Technologie, Raum Zaun, Wetter Manipulationen sind kein Zufall oder haben etwas mit Erforschung zu tun. Dass man ein Globales Gitternetz erstellen will in dem alles Kontrollierbar ist ,aber es wird niemals Funktionieren Die Natur ist schlauer als all diese Luftakrobaten und Giftsprüher zusammen .Das was kommen wird werden extreme Wetter Kapriolen sein und die Zerstörung der elementarsten Lebensgrundlagen für die Menschen auf diesem Planeten .Ich selbst vermute noch viel schlimmere Dinge hinter dem ganzen . and now in English please, my friend? Plausible.....not undefeatible or undefendable....such is divine human spirit...it has yet to be mapped!